Regan Stout, pictured here, likes playing close to her home in Williamsport, Maryland, and wants to be a Pediatric Nurse. Regan Stout, a senior defender on the Shepherd women’s soccer team, is from Williamsport, Maryland. She sat down with The Picket to talk about her time at Shepherd on and off the field and what she plans on doing when she graduates from Shepherd. Stout, who named to the Commissioner’s Academic Honor Roll in 2016, believes that she was not only brought to Shepherd to play soccer, but to more importantly get a good education. She says that school comes first and that it is very rewarding to be recognized for her academic achievements. 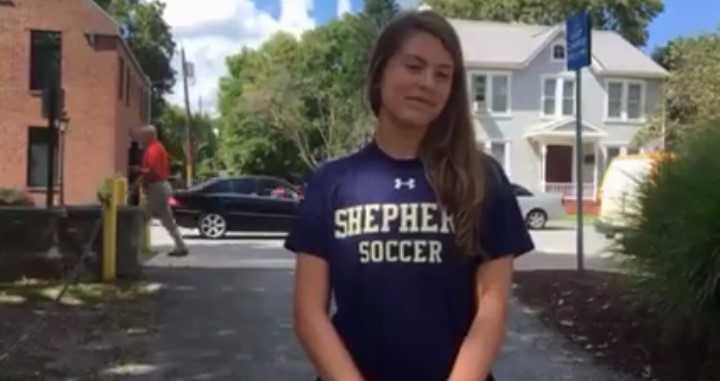 Regan commented that it is great that she plays at Shepherd because it is not far at all from her home in Williamsport, Maryland, so her friends and family can come watch her play. She likes to be able to go home when she needs to and that she has freedom to see her friends and family when she wants to, which not every student athlete can say. In regards to how she feels about being named to the NSCAA NCAA II Women’s All-Atlantic Region Team and as an All-MEC Second Team honoree, Stout is very proud to see that all of her hard work has finally paid off. During her time at Shepherd, Stout stressed the fact that at practice there are times when you have to be serious, but some of her favorite memories are when there were times when she could joke with her teammates when appropriate. On road trips, Stout really loves how she gets to know her teammates and forming lasting memories with them. When she graduates at the end of this school year, Regan will have a degree in Nursing. Her desire to be a nurse surfaced because she has always wanted to help others and have a great impact on others’ lives. Soon after she graduates, Stout wishes to become a Pediatric Nurse and help as many sick and injured people as she can. Watch the video below to learn what Regan wants her coaches and teammates to remember her as and how she has improved on and off the field since she was a freshman.